Tarantulas are a part of the Phylum called Arthropoda, which includes all bugs. The Subphylum is Chelicerata. Their Class is arachnida, which includes ticks, scorpions, etc.... From there, the tarantula belongs to the Order, Aranae, which includes all spiders followed by the Infraorder called Opisthothelae. Then there’s the Suborder called Mygalomorphae and the Family of Theraphosidae. Next are the many Subfamilies in which Theraphosinae is the largest. Then comes Genus and last but not least is Species. 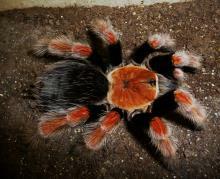 Most tarantula dealers only use the genus and species name along with the common name to identify a tarantula. For an example in a pet store you would see the common name, which may vary from pet shop to pet shop, Pink Patched Birdeater, then the scientific name Acanthoscurria antillensis. In Our collection, we are only interested in the COMMON NAME, the GENUS, and SPECIES scientific name. The World Spider Catalog, Version 16 list the family Theraphosidae with 983 species and counting. They can be found in most parts of the world, and on every continent, except Antarctica. They have adapted to all types of environments, from the deserts of North America to the monsoon rain of Asia, from the humid rain forest of Brazil to the arid terrains of Chile. Tarantulas are the largest spiders on earth. Some species of tarantulas can grow to sizes of 10 inches or more, while others may only attain a leg length of 2 inches. I have a Theraphosa blondi in my collection that I raised from a spiderling to 10.5” (26.67cm). I also own an adult Aphonopelma paloma that has only grown to a robust size of 1.5” (3.81cm), stretched. Meet "David and Goliath." There are certain phrases you will hear in the arachno community that you need to familiarize yourself with. You will hear lingo like Old World and New World species. "Old world" tarantulas are from Asia, Europe, Africa or Australia. "New World" tarantulas are found in North, Central and South America. You will also hear in the hobby terms like arboreal, terrestrial or burrower (fossorial). Arboreal tarantulas make their homes in silk "tube webbing", which they build of silk, in trees or elevated places. Terrestrial tarantulas may or may not burrow; they are, for the most part opportunistic burrowers. They will live in an abandoned burrow, under a log or in the crevices of rocks. When I used the expression “burrower”, I am talking about obligate burrowing tarantulas. This is a tarantula that needs a burrow that is at least twice the length of its body to live stress free. Burrowers spend most of their lives inside of their burrow. I have a Great Horned Baboon (Ceratogyrus brachycephalus) that I haven’t seen out of its burrow in about four (4) years. I also have a King Baboon (Pelinobius muticus) that I haven’t seen out of her burrow in eight years, since I attempted to breed her. I can view her, because the burrow is along the sides of the terrarium, with little or no webbing. What an awesome sight! It makes keeping a burrower a rewarding experience. Whether the tarantula is arboreal, terrestrial, or burrower, should be a determining factor in the choice of tarantula you select. I hope this site gives you enough information to make a good selection. I am a hobbyist and not a taxonomist. My profession is pastoring and I have a Master Degree in Biblical Studies. I respect the men and women who do the field and lab research to classify these animals. They have a laborious task before them. This website is not to identify any species of tarantula, but for tarantula husbandry, even though most of the tarantulas featured here has been identified and classified. I understand that it takes more to identify and classify a species than just looking at the coloration, size, locale of species, and in some cases spermatheca. Therefore, I leave the identifications and classification to the professionals who have gone to school for that purpose. I only follow their lead. There are websites that you may go on to get into the publication and citation of a species. Because knowledge is always increasing, I frequent The World Spider Catalog to update and make changes to the scientific names of the tarantulas on my website, that have changed. Enjoy this website, and "TO GOD BE THE GLORY, FOR THE GREAT THINGS HE HAS DONE!"